Although a U.S. university was her first choice, the Stingers soccer leading scorer and star Melanie Poirier is happy she chose Concordia. 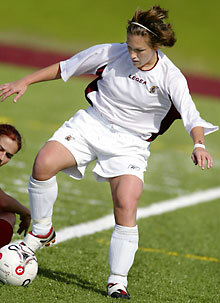 Rookies don’t usually merit the attention that Melanie Poirier of the women’s soccer team does. The bright young star from Laval was heavily recruited by the Stingers coaching staff this past summer. Once options south of the border dried up for her, Poirier happily chose to come to Concordia. Poirier, the team’s leading point-getter so far this season, scored the only goal in a 3-1 loss to Laval at Concordia Stadium last Sunday afternoon. The setback eliminated any chance the Lady Stingers had of advancing to a National berth. Concordia (6-6) sits in third place with just two regular season games remaining. “Yeah, I was expecting the team to do better,” said Poirier, who is studying Athletic Therapy. “I was pretty excited with what I saw in the tryouts. We just didn’t come together like I thought we could. Poirier was one of the most sought-after players in the province in the off-season. The Stingers, who made recruiting a priority for 2003, are on a rebuilding mission and hope to contend for the National title next year. The 5-foot-3, 135-pound defender grew up playing soccer in her native Laval, including four years with the AAA Laval Conquerants before transferring to the under-18 Lac St. Louis Lakers last year. She was an important part of the Lakers team that won a silver medal at the national club championships in Calgary last October. She also played for Lakeshore United’s senior women’s team this summer. “Melanie brings a component of competitive experience and skill level that makes an immediate impact,” says Stinger Coach Jorge Sanchez, who has seen Poirier play since she was 14 years old. Poirier also enjoyed a four-year term with Quebec provincial team, capping things off with a bronze medal at the U-17 Canadian All-Star Championships in 2001. She also earned an invitation to train at Quebec’s national training centre. In addition to her club and provincial team experience, she participated in Laval’s high school Sports-Etudes program before moving on to Dawson College where she played for two years. Poirier plans to be back with the Stingers next season, which is good news for local soccer fans.